Haha! Love number 7 for business owners. Worthy plug. Black box is right. Though it MIGHT send some running for the hills, the brutal truth is the way to go. I think prospective clients appreciate the honesty – even if they don’t like what they are hearing. In the event things go south, it doesn’t come as a shock, and you’ve prepared a back up plan together. Great point about the “black box.” For me, it’s either bring it up early or have to explain later. A pretty simple choice, IMHO. As you say, people appreciate the honesty. Awesome, Awesome post again Phil. Off to add this at the Local Search Forum. And soon I’m launching a new forum for the business side of local search: Pricing, packaging, prospecting and managing your business. YOUR POST is going to be one of the stickies right on top! Thanks, Linda – as always! I appreciate the great feedback and your post on THE forum. That business-side forum sounds great. There’s some good info floating around out there, but not much under any one roof. If//when you build it, I look forward to seeing what you come up with! I thought you’d like this one, Ken – thanks! Great post, Phil and the questionnaire is key, you are so right. We send a similar version to the client as soon as we take them on. We ask for a few other things as well. Google logins, pics, links to vids, cms/ftp logins, any promos or offers, etc. We try to get all so we can use it for local seo and local ppc. Thanks for the insights. I actually have a second part to that questionnaire, which I send a client once we’ve moved forward. It asks for some of the stuff you mentioned (logins, etc.). I’m sure the idea behind yours is similar to the idea behind: namely, make the first questionnaire really un-daunting and easy to fill out – i.e. only the essentials and info you need to give it a green light or red light – and only ask for the stuff you need for implementation (logins, FTP creds, etc.) once you actually need it. I just want to add that a divorce is o.k. if you find yourself in a “relationship” that goes bad. I have only had to “divorce” myself from a client once. We got along great and there were no issues except one thing – the client was slow to respond to my emails and wanted to micromanage every step I took in the process. We were spinning our wheels working together. I finally talked to him and just told him things weren’t working and that I would of course refund his money and would help him find someone else to work with (which is what I did). We parted on great terms and to this day we still communicate. The point is, sometimes a good match goes bad and when it does, it’s best to part ways than try to fight through it. Such an excellent job,. . i am glad to read this through @Nyagoslav tweets . .! Glad you found my post! Awesome write-up Phil! 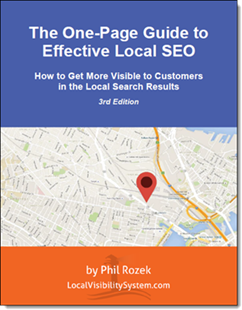 I think these points are valid not just for local SEO (as you mentioned), not even just for SEO in general, but for any kind of Internet marketing services. Thanks a ton for mentioning my guide, too! Thanks for stopping by, Nyagoslav! No problem on mentioning the guide; again, it’s great, and I know that sort of thing helps both parties get a little better-acquainted. I believe that any relationship whether its professional (or) personal fails only for the sole reason that need matching does not happen in the best possible way. In any relationship there are minimum two entities involved. The longevity of any relationship is a function of how broad (or) narrow is this gap on need matching.